that we put the thought out of our minds and concentrated on the new year ahead of us. It wasn’t until April when Edwin emailed Matt about travel dates that our hazy daydreams of an idyllic tropical adventure actually began to take form. Next thing we knew we were standing at the airport in Male with our 2 best friends and their 5 month old baby, breathing in the steamy tropical air and wondering whether this unbelievably kind offer might just have been a little too good to be true.. The airport crowds parted, and we all breathed a sigh of relief to see Edwin standing there with a huge, welcoming smile on his face. Just metres from the front doors of the airport, our private speedboat awaited us and made us feel a little like we were in a James Bond scene despite the fact that we were sweaty and dishevelled from 26 hours of travel. As we made our way north to our first resort, a tropical lightning storm danced overhead and phosphorescence created a trail of bright blue sparks in the ocean behind us. Already a little bit in love with The Maldives, we passed out in our ocean huts without even bothering to check out our surroundings. As usual, Matt and Owen were up at the crack of dawn to check the surf. After a much needed sleep-in and a long, leisurely outdoor shower to wash away the jetlag, I finally emerged from our hut to realise that we were positioned straight out the front of one of the clearest, most beautiful lagoons I have ever seen. Laden with shady palm trees and hidden hammocks, I was slightly tempted to ditch the others and spend the morning curled up with a good book and a fresh coconut. The fact that the boys had already been gone for almost 3 hours was a little worrying though, so Kita, Vali and I made our way to the surf side to see just what was taking them so damn long. When we first arrived at Lohis, the reason for their long absence became crystal clear. I’m the first to admit that I’ve never surfed a wave in my life, but I have seen my fair share of surf comps and there was definitely something uniquely beautiful about this wave. Turquoise and clean, big but gentle, it was the kind of wave that you could sit and watch for hours on end. Lucky for Kita and I, our breakfast table was positioned on a viewing platform right in front of the surf and we spent our first morning in The Maldives sipping tea, watching waves and sampling some of the incredible local cuisine including our personal favourite – a mouth-watering dish of tuna, coconut, onion and chilli known as Mas Huni. Every now and then one of the boys would come in from the surf, sit down for breakfast, then get too anxious about missing out on the waves to even finish their coffees. At midday, the exhaustion set in and we headed to the other side of the island for a change of pace. The lagoon at Hudhuranfushi was exactly what I had conjured up in my Maldivian daydreams before the trip. The water was so clear it was almost fluorescent, but the impossible number of coral reefs and ever-changing sand banks created a mottled effect with seemingly infinite shades of blue as far as the eye could see. Tiny islands speckled the horizon, and Kita and I floated on our backs to watch birds glide effortlessly through the dreamy blue skies. Of course, the boys missed all of this because they were fast asleep on their daybeds..
After lunch, I decided it was about time that we put the beachfront hammocks to the test, so we whiled away the afternoon in the state of supreme relaxation that you can somehow only ever achieve on tiny, tropical islands. When 5 O’clock rolled around, it occurred to us that it was our first official night of vacation. Considering Hudhuranfushi is an all-inclusive resort, every second that we spent without a beer in our hands seemed like a shameful waste of time. We bar-hopped around the island until dinnertime, then enjoyed an incredible buffet dinner in the overwater Sunset Restaurant. Reef sharks cruised by in the turquoise waters below us, and the sounds of karaoke in the distance gently beckoned us closer. By the time we made ourselves comfortable in the poolside bar, the jetlag was well and truly taking over and we saved ourselves a hell of a lot of embarrassment by skipping out on karaoke and going to bed. 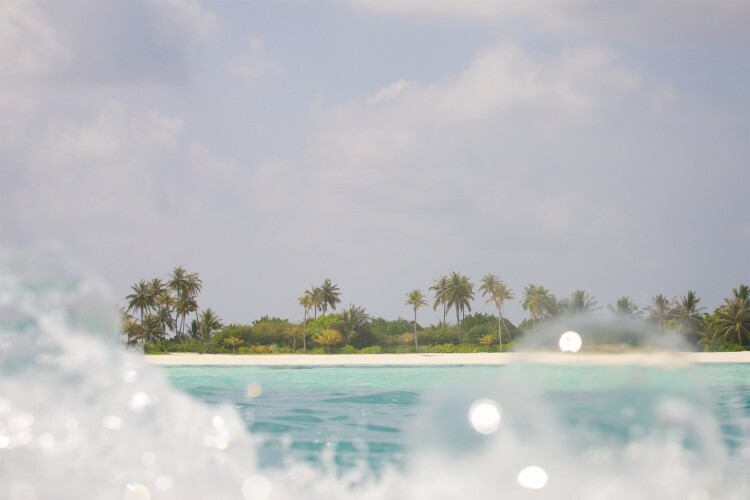 One more morning of amazing waves and it was time to say goodbye to Hudhuranfushi and head south to Niyama. Our time on this island was a happy blur of beach walks, perfect waves, hammock naps and amazing food. If you’re a surfer, you’ll find consistent waves from mid-March to late-November every year. After two days of surfing, Matt and Owen described Lohis as a high performance wave that is perfect for intermediate/advanced surfers. It looks just as beautiful as some of the famous reef breaks of the Pacific islands, but when the waves are overhead you’re not going to get flogged on the reef like at Teahupo’o or Cloudbreak. Apart from Lohis, there are plenty of amazing waves nearby that suit almost every level of surfing. Keep in mind that all the waves break over reef so they’re not suitable for complete beginners. For those of you who don’t surf (like me) or with children in tow (like Kita), you’ll still absolutely love your time on this island. The vibes are super relaxed, and if you find yourself getting tired of watching the surf or relaxing by the beach, there’s so many beautiful places to explore, restaurants and bars to discover and water sports to enjoy. For somebody who travels for half the year, it’s a little embarrassing to admit that I actually have a crippling fear of flying. As we stood in the seaplane terminal at Male airport, I took some deep breaths and thought about fruity resort cocktails with tiny little umbrellas on top. 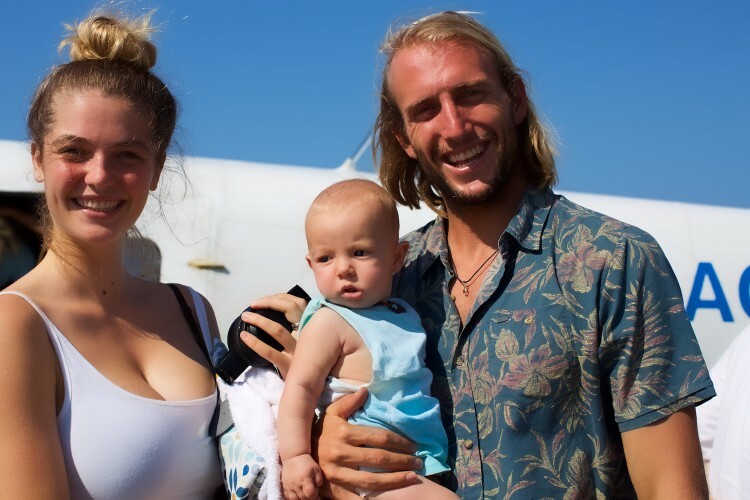 Matt, Owen and Kita were all buzzing with excitement, and I tried my best to do the same as we boarded the plane for the 40-minute flight to the island of Niyama in the Southern Atolls. Once we were airborne, every ounce of fear melted away and I spent the entire trip glued to the window, trying to decide which of the tiny island utopias below I would buy if I miraculously became a billionaire. As we finally circled around our island home for the next 4 days, I don’t think any of us have ever been quite so awestruck. Per Aquum Niyama from above looks like a tiny jewel set within the vast Indian ocean, coloured with lush green rainforest, ivory white sands and dazzling turquoise seas. As we piled out of the seaplane onto the boardwalk, we were greeted with chilled towels, cocktails and a team of staff who were all there to happily attend to our every need. Honestly, on an island as beautiful as this you could give me a one-man tent and some canned tuna and I’d probably be happy, but what’s wrong with a little extravagance every once in a while? The resort covers two islands that are connected by an overwater boardwalk, and everywhere you look is a tropical beach scene worthy of any magazine cover. Our rooms were situated right on the water, with private infinity pools and an outdoor bathroom nestled within thick rainforest. Every activity you could ever dream of is right at your doorstep, from snorkelling to jet skiing, sunset fishing to simulation golf. The island’s restaurants offer some of the best food that I have ever eaten, each with their own unique theme. We sampled Thai food in a jungle treehouse set 20 feet in the air, feasted on an African smorgasbord by a tribal campfire, and drank cocktails in an underwater aquarium situated half a kilometre out to sea. The luxuriousness of the resort was overwhelming, and we had to be very careful not to get too carried away with massages, morning mojitos and moonlight margaritas to be distracted from the real reason that we were here. And what an incredible reason it turned out to be.. When Edwin told Matt and Owen that this picture perfect island paradise had a decent surf break, they had imagined that it would be a novelty-sized wave that was more of a convenient ‘add-on’ resort feature than a major selling point. What they didn’t expect was that they would both be finding one of their favourite waves on the planet (no exaggeration, I promise!). Vodi is situated on the southern tip of the resort, right out the front of a secluded reggae surf shack that provides an incredible viewing platform for this beautiful left. 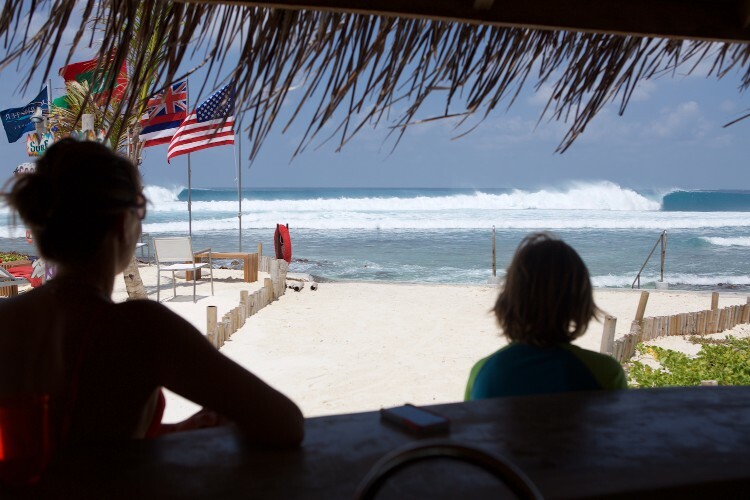 On its best day, it was a 6-8 foot barrelling reef break that offered long, clean, perfect waves from dawn until dusk. Even on windy, smaller days it was still a fast-paced, fun wave, great for perfecting airs and turns. Much like Lohis, this wave is great for transitioning to surfing over a reef because it’s not nearly as shallow as most of its tropical counterparts. Make sure you’re paddle-fit before you attempt to surf this wave on a big day as the current can be extremely strong. We also explored the other waves in the area by boat. Dreamliners is 5 minutes southwest of Vodi, and offers right-handers of up to 300m with a mellow first section and a speedy finish. Kita and Owen surfed this wave together on one of the smaller days of swell, with Kita impressing us all with her stylish long-boarding skills and a dreamy little barrel on her final wave. Eddie’s Right (named after our favourite host) is a short, barrelling right-hander that suits a big, southwest swell. If you’re not a surfer, I would highly recommend tagging along on these boat trips because there’s amazing snorkelling almost everywhere you look around these waves. The coral reefs are teaming with colourful, tropical fish and the deeper waters are a great place to spot dolphins, hammerhead sharks, sea turtles, manta rays and even whale sharks. Our last day on the island rolled around far too quickly, and as if to tempt us into cancelling our flight home (and punish the boys for drinking too many cocktails the night before), Vodi put on an amazing display of perfect barrels with not another soul out. Our seaplane departed at 3pm and we were still trying to drag the boys out of the surf at 2.45. All in all, this is one of the best places we have ever had the pleasure of staying. Whether it’s a surf trip, a family holiday, a honeymoon or just a much needed break, I don’t think you could ever ask for anything more. We said farewell to The Maldives with heavy hearts, but have so many incredible memories to take home with us. Special thank you to Edwin and Jette from Clearwater Surf Travel for organising such an incredible trip and putting up with our terrible disorganisation (and hangovers), to Richard from Hudhuranfushi Surf Resort for risking life and limb to take such epic photos, to Roderick for capturing it all on film and keeping it weird and whacky, to Geoff for forcing us to drink champagne under the stars, and to all of the incredible staff who looked after us so well. We’ll be back as soon as possibly can!